A woman who was filmed by staff as she urinated at US president-elect Donald Trump's Aberdeenshire golf course has been cleared to pursue damages. Rohan Beyts, 62, said she had to "answer the call of nature" at sand dunes after walking on the beach near Mr Trump's Menie resort in April. Ms Beyts was reported to the procurator fiscal but no action was taken. A three-day civil hearing for breach of privacy will be heard next year. Mike Dailly, acting for Mrs Beyts, said attempts to have the case dismissed had failed and the case would now be heard at Edinburgh Sheriff Court in April. Mrs Beyts told the BBC Scotland news website she was "glad" the case was proceeding, adding that April would mark a year since the incident. 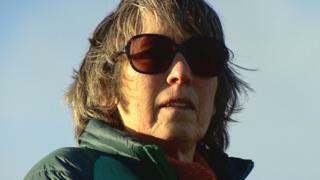 The retired social worker told BBC Scotland in October she had no option when she needed to answer the call of nature. She said: "When I discovered men had been filming me I felt really uncomfortable - mortified. "It's ironic they said my act was disgusting but you hear about Donald Trump's claims about women. I know which I think are disgusting." A spokeswoman for Trump International said: "Our position on Rohan Beyts' claim remains unchanged and the matter is now in the hands of our lawyers." Mr Trump opened his Menie course in July 2012 after lengthy opposition from local residents and environmentalists. The course, which is owned by Trump International Golf Club Scotland, lost just under £1.1m in 2015.